She was panicking, overwhelmed or something, and so I switched tactics ever so slightly. “Shelly, Shelly, look at me.” I needed her to look me in the eye, I needed for us to be clear on this. I put my hands to either side of her head and those sapphire eyes darted to mine, she was on the verge of really freaking out. I rested my forehead against hers and made soothing sounds until the fear left her body, muscle groups losing their tension one by one, until her eyes closed and her breathing slowed. Her eyes opened and she did what I needed her to do, she looked at me. “I’m only going to say this once, so you’d better listen and you’d better listen good. I am not a onetime thing, Honey. You have to understand, there is no one and done here. I don’t care if I’m the best you’ve ever had or the worst… This is it. You sleep with me and you belong to me and that means all of you, the broken bits, the jagged bits all of it. You on a good day, you on a bad day, it doesn’t matter. I’m not like those other guys. I don’t do casual, there has never been one and done here and there never will be. You do this… We do this… It’s forever. You get what I’m saying?” I stared into her eyes from bare inches away and they became luminous with her tears. She sniffed and she trembled in my hands, I smoothed my thumbs beneath her eyes and wiped away the tears. It killed me when she cried. What I’d said needed to be said but I was also hoping it would piss her off just a little. She seemed to center out a little better when she was angry, but anger isn’t what I got from her on this, which surprised me. “Is that what you see when you look at me?” I felt a small surge of triumph. “That and a whole lot more just waiting to be discovered if you’d let me,” I told her. She sniffed and pulled her face from between my hands, rubbing the tip of her nose with the back of her hand. “You think about it,” I told her gently, and blinked in surprise when she scoffed. “I don’t have to think about it Ghost!” she cried, “It’s all I’ve ever wanted.” She dropped her hands from my shoulders and sighed out, her eyes closing. “What Honey?” I asked her. “Just promise me that this isn’t because of what I said on the mountain.” I laughed a little. Just a question any idea when the audio books for the rest of the series will be out? I can’t wait to have the entire series. 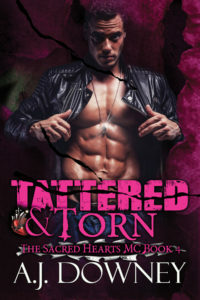 Tattered & Torn just came out and we are all hard at work on the rest. The whole first series will be out by the end of this year and we will start on the rest as soon as that is done. I do announce when they are out in my newsletter. You can sign up for that on the website, here at the top.